100 years have passed since the Bauhaus opened in Weimar, moved to Dessau and was closed by the Nazis in 1933 in Berlin. The lessons of its short existence though are not lost, the opening ceremonies and performances for 100 jahre bauhaus from January16 to 24 at the Academy of Art, Hanseatenweg Campus, in Berlin, were magnificent proof of it. The architectural and cultural world of the 20th Century was majorly influenced by the impact of icons like Walter Gropius, Wassily Kandinsky and Oskar Schlemmer. The entire year 2019 is designed to prove it with 600 events planned so far throughout Germany and with international resonance. To continue and honor the efforts of the Bauhaus founders and members, the motto of Bauhaus 100 will be: To Think the World Anew (Die Welt neu denken). The hope of the organizers of this gigantic undertaking is using the planned openings of the new Bauhaus Museums in Dessau, Weimar, and later in Berlin, to bridge the beginnings of the Bauhaus with present developments throughout the world. And, thus, help form the future of our globe through design, technical engineering and cultural fusions. 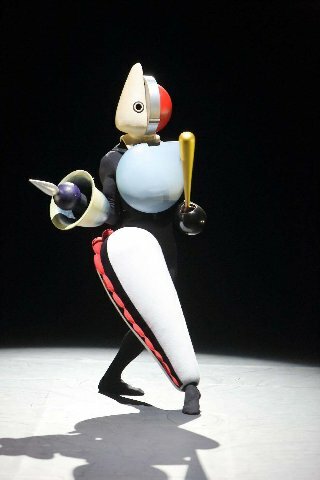 Whoever was lucky enough to get tickets to the opening events, in particular to the exhibit, or Sandra Huellers performance, or the resurrected version of Oskar Schlemmer's fabulous Triadisches Ballet and to Das Totale Tanztheater 360 choreographed by Richard Siegel, will be in awe as to the impact what 24 years of forward thinking at the Bauhaus had started and how it continues to shape our world. For all others there are the websites. Continuously updated, they will have all the dates and times of events of Bauhaus 100 for the rest of the year. Direct links follow this article below. The first of the highlights came with TXTORRENT where the actress Sandra Hueller, (daughter in the film Toni Erdmann) and the musician Carsten Nicolai created a dada-inspired music-performance-language-collage, a wonderful introduction to the Think The World Anew motto of the entire festival. 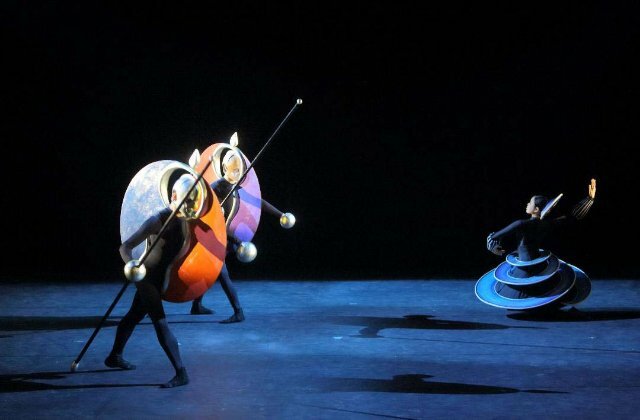 Of course, the center piece of the opening festivities was Oskar Schlemmer's Triadic Ballet (Das Triadische Ballett) from 1922, reworked in 1977 by Gerhard Bohner with costumes recreated in detail from the originals. 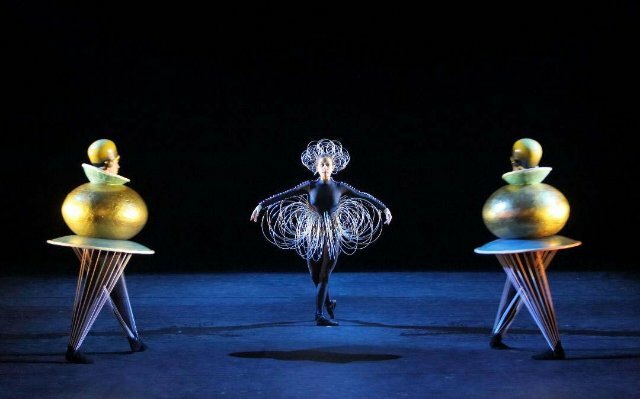 It is a stunning performance, visually as well as a Gesamtkunstwerk danced by the Bavarian State Ballet. Throughout the year, it will be shown again in different locations. It is certainly worth a trip. Das Totale Tanz Theater 360 is based on an idea by the Interactive Media Foundation and was choreographed by Richard Siegel as a virtual reality installation for man and machine. Visitors immerse themselves into dance actions over several virtual levels. They activate and individually participate by wearing virtual reality glasses and moving a device. It was an idea of Walter Gropius but could not be technically realized during his lifetime. These were formidable opening performances. It was possible to see the cultural aspects of the developments touched upon by the pioneers of the Bauhaus and one could sense what creations and developments will await mankind based upon the seeds planted 100 years ago. The celebrations throughout the year will highlight many more accomplishments of the Bauhaus and their founders. "Sounds great. Wish I were there!" "I’m very excited to see this work get its due. With this immersion so many young artists will fall in love with its dynamic nature."